2 Bikes. 2 Toddlers. 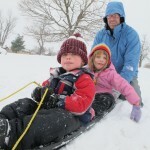 1 Epic Family Adventure. I’m writing today because I miss you all and I miss the road. Just one year ago we woke up early at the Flordia Caverns State park and were overwhelmed by the hospitality of Walter Spence and Debbie from the Marianna post office. I’m also worried about some of the folks we stayed with, especially Terri and Linda, Linda, Harry, Harold, Mike, the Whetstines, and those in the path of the tornadoes and floods. The email address I gave out when I was on the trail has been disabled, but I would love to reconnect with folks at my current e-mail address: kate.b.murr@gmail(dot)com. I am well aware that I haven’t posted the last post for the last day of the trip, and don’t know why I still feel a strange tug not to do that, but such is the case. It was a fantastic finish, we rode down a hill and the kids were laughing in the trailer, squirting each other with their water bottles. I was grinning so big I ate bugs. We listened to Big Smith and coasted down the foggy main drag in St. Augustine where the Blantons and the Cleeks greeted us with excitement and champagne and much hugging. I think I’m still processing all the feelings I was experiencing then. But good grief, it’s been a year since we started! The children are fantastic! Jane is finishing up kindergarten, and has graduated from the Burly trailer to a blue tag along “that matches Daddy’s bike.” And Brady is four! 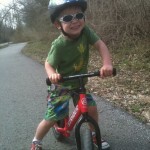 He now has his own “fast, red bike,” a strider without pedals that he coasts around on at lightning speed. 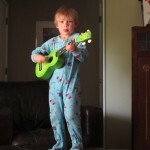 These days, he is a rock star as well as a super hero, and he plays his sparkly green ukulele with all his heart. Stuart is still designing and building homes, but he’s also the Assistant Brewmaster/Facilities Manager/House MacGuyver at Springfield’s newest microbrewery, Mother’s Brewing Company. Mother’s grand opening is next weekend and we’re all extremely excited. I’ve been busy with the kids and volunteering at Urban Roots Farm, a model farm for sustainable urban family farming, but I’ve also been writing away on a book about our cross-country adventure. I am learning so much about the writing process continue to enjoy discovering our journey through a retrospective lens. I’m writing some articles that I hope to submit to magazines, and I plan to have at least half of the book completed by the end of the summer, at which time I’ll actively begin submitting proposals and seeking publishers, editors, and agents. Next fall I’ll be teaching and studying creative writing at Missouri State University as I seek my masters in English. There’s a new adventure around every corner, eh? So, if you get this, and we haven’t connected in a while, could you please send me a note to know you’re fine and how your family fares. We have put together a few presentations to speak for bicycle advocacy and I’m linking to one here so that we can remember together some of our adventures and the people who made them fantastic. 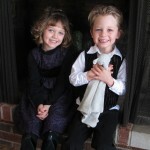 This entry was posted on Tuesday, May 3rd, 2011 at 11:44 amand is filed under . You can follow any responses to this entry through the RSS 2.0 feed. You can leave a response, or trackback from your own site. Blessing on all of you! I am proud of you and look forward to the book. Kate, I see you all the time and I really enjoyed learning more about you, your plans, and what going on. In the rush of the day to day debris of life we often miss the meaningful thoughts that dwell in others minds. Thanks for sharing what is knocking around in yours. I also pray that the kind folks that made your trip such a wonder to watch are doing fine.